Applying to Bridge’s English Programs in the USA is Easy! Whether you are just starting out as an English student in the USA, or transferring to Bridge from another center, our advisors are here to guide you every step of the way through the application process. Your first step is to fill out this form, which asks some basic information about you and your plans to study English in the USA. Once you submit this pre-application, an advisor will get in touch with you to answer questions and discuss next steps, which include collecting the necessary documents (copy of passport and financial documents). Once you have chosen the right program and completed the Bridge application process, we can help you with the process of obtaining a student visa to study English in the United States (if you are transferring from another center, click here). 2. If your sponsor is not citizen or resident of the USA, he/she must write a letter stating that he/she will support your studies at Bridge. 1. After you have submitted your pre-application, complete your full online Bridge application through this link (Please upload your application documents and pay your registration fee during this step). 2. We will contact you within 24 hours of receiving your Bridge application in order to confirm any next steps or answer any questions. 3. We will issue your document I-20 (the document that will support your visa application) within 2-3 business days of receiving your Bridge application. Please note: If you want Bridge to send the I-20 to your country, shipping fees will apply. If the visa application is rejected, Bridge will refund any tuition deposit paid, but not the registration fee or mailing fee (both of those are non-refundable). Contact your Admissions officer for more information. 1. Pay the SEVIS fee* ($200) and print the I-901: https://fmjfee.com. 2. Set up an appointment with the U.S. embassy in your country**: https://www.usembassy.gov/. *Contact the embassy to check what other documents you might need for your interview. Transfer to Bridge and complete your English studies with us! We make it easy to transfer from your current language school to study with Bridge at our modern language center in beautiful downtown Denver. 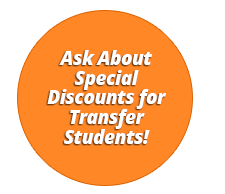 Our Advisors are here to assist you with the transfer process! The transfer process is easy! You can transfer to Bridge from another language center in just 3 easy steps. A Transfer Request form. Download the form here. 1. After you have completed the Pre-Application, please complete your full Bridge online application through this link (Please upload your application documents and pay your registration fee during this step). 2. We will contact you within 24 hours of receiving your application in order to confirm any next steps or answer any questions. 3. Fill out the top of this Transfer Request form and send the form to your current school. 4. Your current school will send the Transfer Request form to Bridge via fax or email. The course should then be paid in full (required 14 days prior to starting your course). 5. Your current school will then release your SEVIS records to us prior to your first day of class. Once your I-20 has been released, please report to the school on the first day (as outlined in your acceptance letter), take your placement test*, and get started with class! Note: Don't forget to request your I-20 once your classes at Bridge start. *The placement test takes place on the first day of class! Do you have questions about how to apply? A Bridge Advisor can help!